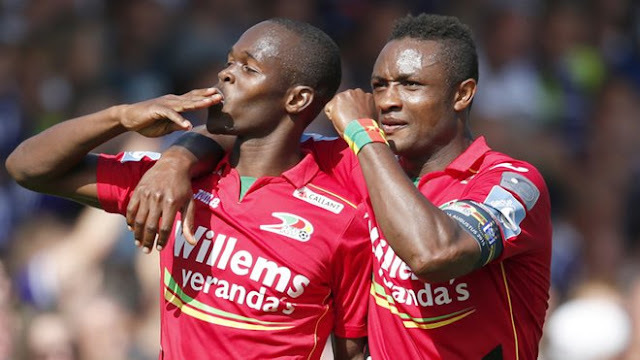 Harare - Barely a year after joining giants Anderlecht, Warriors captain Knowledge Musona has been loaned out to relegation-threatened Sporting Lokeren in the Belgian First Division A League until the end of the season. Musona (28) joined Anderlecht in May last year from KV Oostende, where he found the net 41 times in 141 games, but struggled for form at his new club where he netted in just once in 10 games. Sporting Lokeren confirmed signing the Warriors’ gunman on loan. He is an Anderlecht player until 2022. “Sporting Lokeren can make use of the services of Zimbabwean Knowledge Musona, who until the middle of 2022 is owned by RSC Anderlecht. Sporting Lokeren rents the player until the end of the season. “His loan to Sporting Lokeren means a win-win situation for all parties. Sporting Lokeren hopes to win with him, mainly on his offensive strength. His favourite position is left winger, but he can also be used as a right winger and as a shadow striker. “Sporting Lokeren has made a heavy effort to attract this player,” Sporting Lokren said on their official website. Musona started training with the club yesterday and they are hoping to field him in their next league game away to AS Eupen tomorrow. “Sporting Lokeren is now going to do everything to get him to play on Saturday. In addition to Jakub Reznicek, Musona is the second attacking reinforcement for Sporting Lokeren in three days. Tomorrow morning (yesterday), Musona trains for the first time with the Lokeren,” the club said. Sporting Lokeren anchor the Belgian Division One A League log-standings with 14 points from 21 games, with only three wins, five draws and 13 defeats. On December 27, they lost their last game 1-0 to Club Brugge which is home to another Zimbabwean, Warriors midfielder Marvelous Nakamba. Musona had been reduced to a bit part player at Anderlecht, having failed to replicate the blistering form he enjoyed during his stay at KV Ostende. He struggled to nail down a first team jersey under former boss Vanhaezebrouck who was sacked earlier this month, and he was hoping to have his fortunes changing under new coach Fred Rutten. But it appears Rutten is also not convinced by the Warriors star, who he has decided to ship him out so that he gets game time elsewhere. Earlier reports had linked Musona with a move back to KV Oostende, but it seems Lokeren tabled a better offer for the Smiling Assassin. Musona’s latest move could be good news to Warriors coach Sunday Chidzambga, who wants his man to get the much-needed game time at club level ahead of Zimbabwe’s Africa Cup of Nations (Afcon)’s decisive qualifier against Congo Brazzaville in March. He has been the team’s talisman in the campaign, where the Warriors require at least a point in the home match in Harare to book a ticket to the Afcon finals set for Egypt in June.